As we approach the final days of Advent we wait and pray and watch and hope that when the Saviour comes he will bless us, change us and sanctify us with His presence and fill us with love, peace and grace. Still time for amendment of life, for new beginnings and unknown possibilities to be realised. I haven't noticed so much blatant commercialism this year and a little less materialism is a benefit of the current financial uncertainty. Am I alone in sinking at the thought of all those Christmas cards to be done? A Victorian invention which drains resources better used in another more charitable direction perhaps? For a few years now we have tried to cut out the cards to people we see quite regularly reserving them for distant friends and relations and then give the money saved via our Church to charity. Of course this tends to upset some former recipients but then you can't keep everyone happy. This photo is a diversion and of some wild boar (French- 'Sanglier') like those I saw today in woods on a Monmouthshire farm near here. They looked quite happy with their piglets in the driving sleet which poured all day. 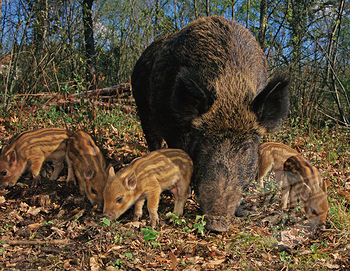 Wild Boar instead of turkey may make a nice change when the festivities do begin! Hark a herald voice is beginning to sound!